Xtreme Off-Road Brite Lites Single Row LED Light Bars are a super slim light bar with powerful 5 watt CREE LEDs to make the light bar as bright as possible. Our heavy duty end mount leg system is the strongest in the industry and most versitle! In 7 lengths from 8" to 48". All are packaged with a quick connect input cable to match our wiring harness options. - The BEST Seller on the single row LED bar!! Fits ATV & UTV brush guards/winch mounts. 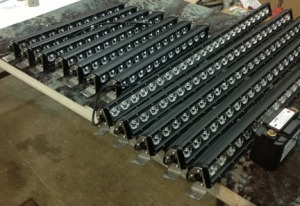 Xtreme Off-Road Brite Lites LED light bar in the Single Row LED design uses 5w CREE LEDs for maximum brightness. Super tough housing acts as full heat sink and provides great protection for long life. Rated to last 30,000 hours. Stainless steel mounting hardware that uses a triangulated mount for superior strength. 8" model has 6 LEDs, uses 30 watts- 2.4 amps, and puts out 3000 lumens.